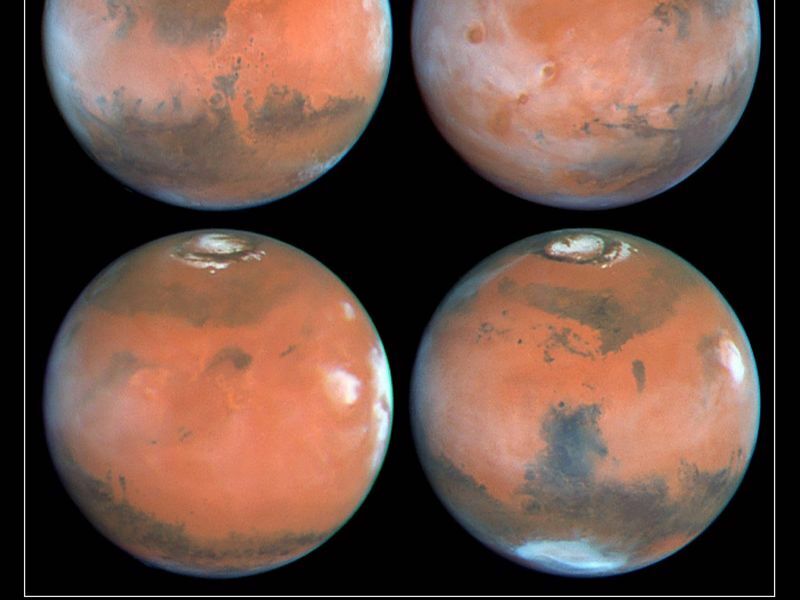 Four faces of Mars as seen on March 30, 1997 are presented in this montage of NASA Hubble Space Telescope images. 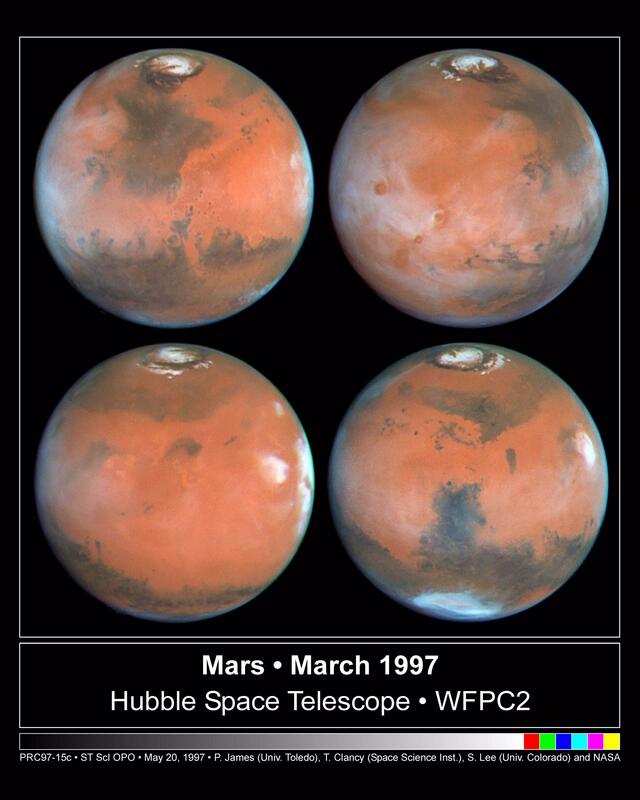 Proceeding in the order upper-left, upper-right, lower-left, lower-right, Mars has rotated about ninety degrees between each successive time step. For example the Tharsis volcanoes, which are seen (between 7:30 and 9 o'clock positions) in mid-morning in the UPPER-RIGHT view, are seen near the late afternoon edge of the planet (about 3 o'clock position) in the lower-left image. All of these color images are composed of individual red (673 nanometers), green (502 nm), and blue (410 nm) Planetary Camera exposures. Upper left: This view is centered on Ares Valles, where Pathfinder will land on July 4, 1997; the Valles Marineris canyon system stretches to the west across the lower left portion of the planet, while the bright, orangish desert of Arabia Planitia is to the east. The bright polar water-ice cap, surrounded by a dark ring of sand dunes, is obvious in the north; since it is northern summer and the pole is tilted toward us, the residual north polar cap is seen in its entirety in all four images. Acidalia Planitia, the prominent dark area fanning southward from the polar region, is thought to have a surface covered with dark sand. Numerous "dark wind streaks" are visible to the south of Acidalia, resulting from wind-blown sand streaming out of the interiors of craters. Upper right: The Tharsis volcanos and associated clouds are prominent in the western half of this view. Olympus Mons, spanning 340 miles (550 km) across its base and reaching an elevation of 16 miles (25 km), extends through the cloud deck near the western limb, while (from the south) Arsia Mons, Pavonis Mons, and Ascraeus Mons are to the west of center. Valles Marineris stretches to the east, and the Pathfinder landing site is shrouded in clouds near the afternoon limb. 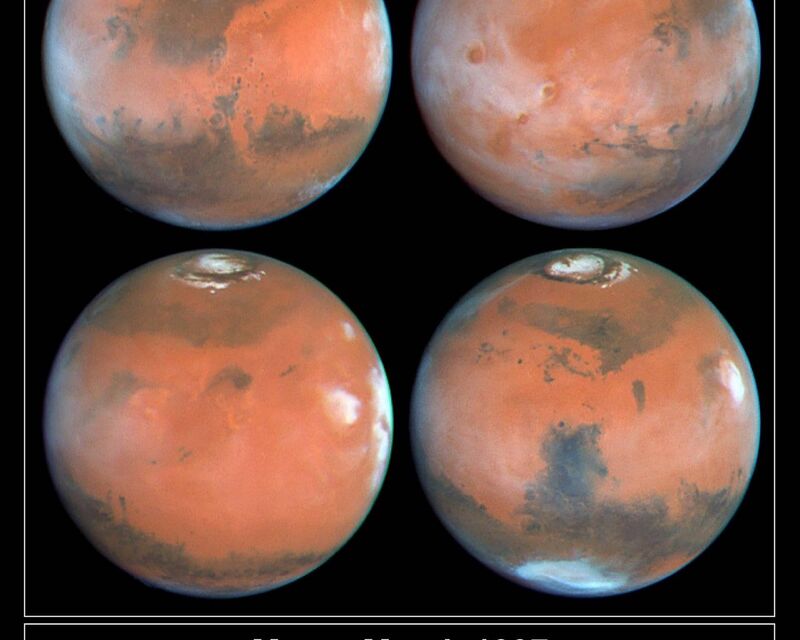 Lower left: This relatively featureless sector of Mars stretches from the Elysium volcanic region in the west to the Tharsis volcanoes (shrouded by the bright clouds near the afternoon limb) in the east. The group of three dark specks just left of center are all that remain of Cerberus, a very prominent dark region during the Viking and Mariner 9 missions. This is an example of the remarkable large scale changes which can occur on Mars due to windblown dust: the former dark area has now been covered by a layer of bright dust, masking the underlying material. Lower right: The dark Syrtis Major region dominates this image. 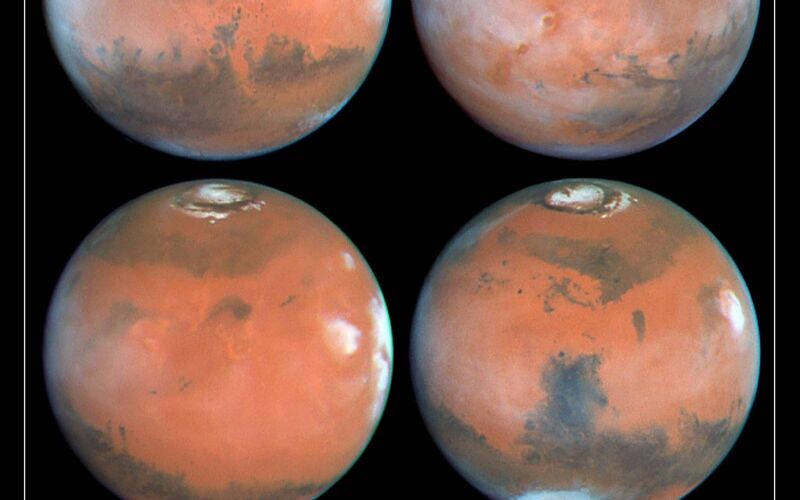 Syrtis Major is one of the most prominent dark features on Mars, and has been visible since ground-based observers first peered at Mars through telescopes. The bright cloud at 3 o'clock is associated with Elysium Mons. The bright bluish-white feature near the southern limb of the planet is Hellas, a 1,200 mile (2,000 km) diameter impact basin formed by the collision of a large body with Mars long ago. Hellas is covered with dry ice frost and clouds during this season (winter in the south).